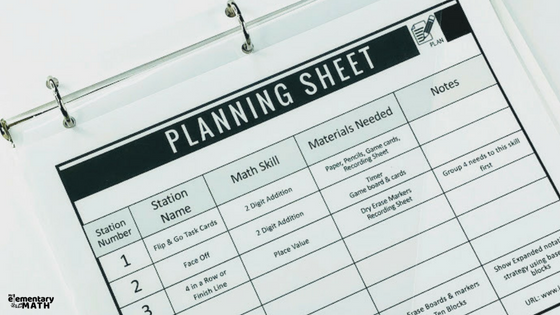 Organizing math centers is one of the major keys to running smooth workstations in your classroom. So, how can you get organized? 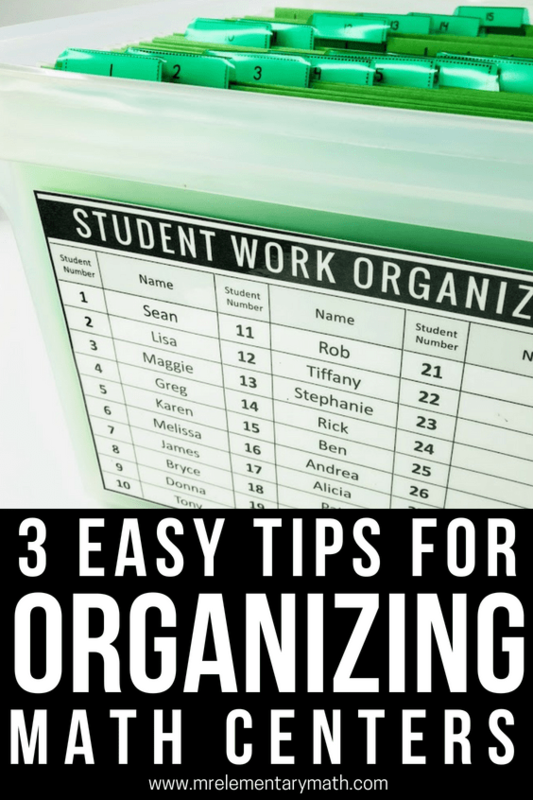 Let me share the 3 areas you need to get organized in order to keep your students on task and have your centers running smoothly. The first thing you need to do is organize yourself. If you’re disorganized, your kids will be too. Here are some things that will make your life a lot easier. 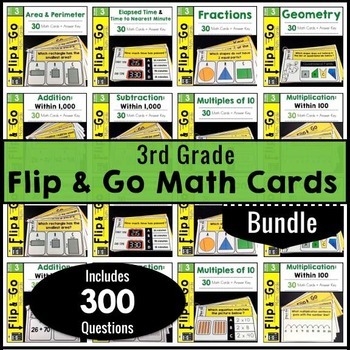 Having a “Go To” place for all of your tools and templates really keeps you organized throughout the school year. Student recording sheets often drove me crazy. I would find sheets hanging out of student desks, on my desk and in other spots throughout the classroom. Organizing the papers was essential to bringing down my stress level. An easy way to handle this is purchasing a filing crate with hanging folders. Then number each hanging folder and assign a number to each student. 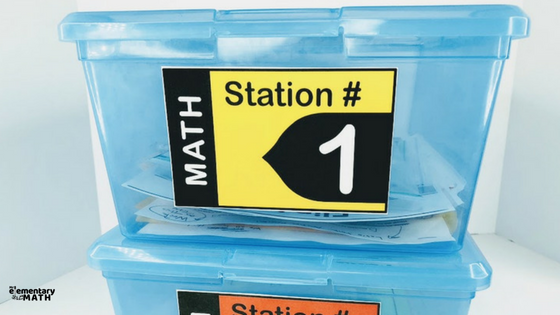 This handy number system is an easy solution to place all of the recording sheets, booklets or math papers that pop up throughout math centers. 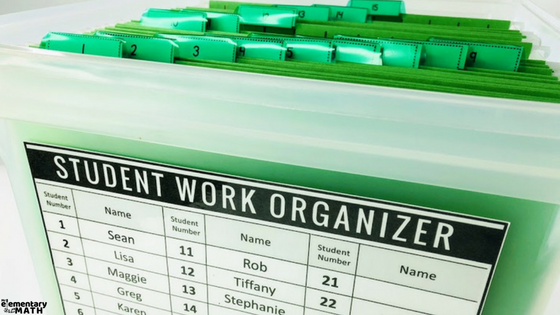 Get started TODAY by downloading the FREE Student Work Organizer (pictured above). What do you do with all of these materials? How do you organize your materials so it’s not all over the place? You need easy access to materials that are not currently in use, but ones that you’ll need in the immediate future. I LOVE sheet protectors! They make it so easy to store your materials (ie. 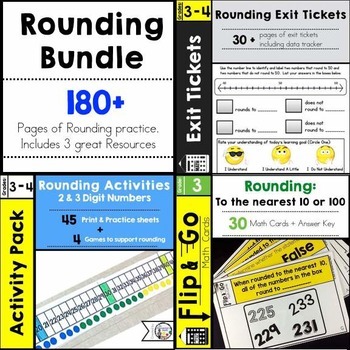 game directions and game materials). Just slide them into the pocket and you can see just what’s inside. PLUS…you can store them inside a binder. I love using gallon sized bags as well as quart sized bags. Whoever invented these, are a friend to all teachers. 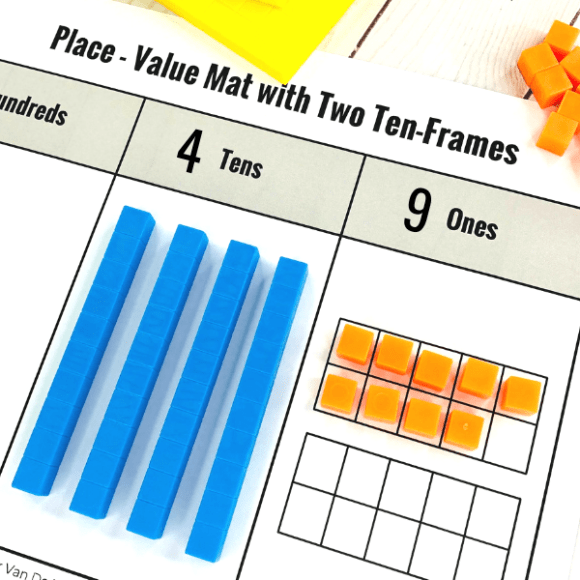 No more missing game pieces or manipulatives. 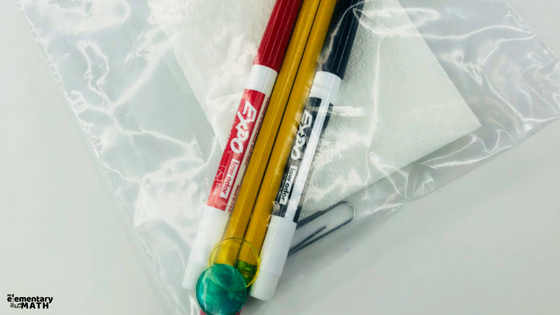 Simply place your items inside of them and hand them out to your teams. 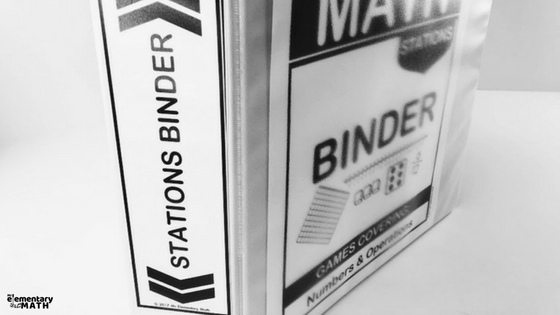 These binders contain your math centers by domain (i.e. number and operations). 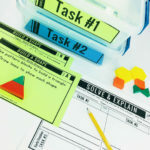 You’ll easily find the skill you want your kids to work on and slide it into their work station. And remember the games and activities in those sheet protectors? This is where you store them when they are not being used. 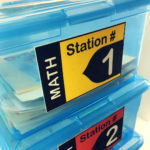 Store all of the materials and activities that students need inside of a see-through storage bin that is clearly labeled. This will be a huge help when it’s time to clean up. This is a place for your kids to place their recording sheets after finishing their work in the center. 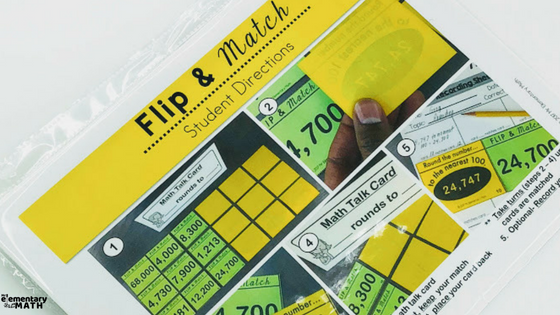 So this wraps up my tips for staying organized during math centers! 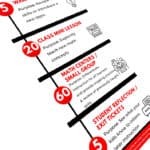 Be sure to try out some of these ideas, if you don’t already use them. 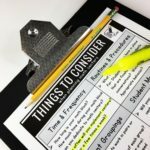 Want to find ALL of the organization tools and templates mentioned in this post + MORE?.. 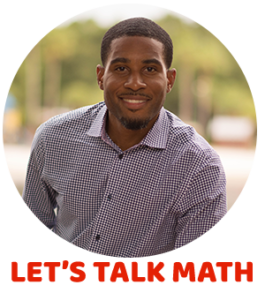 then check out my course Math Centers 101. 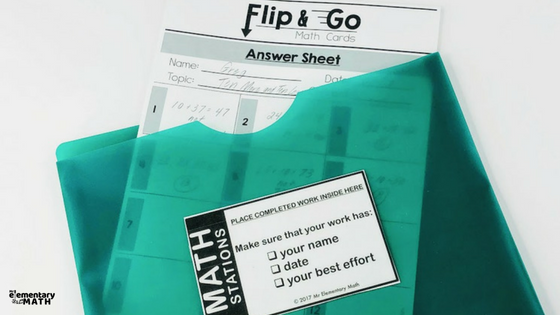 This video course walks you step-by-step through implementing math centers in your classroom.